Perhaps the most ubiquitous lazy girl Halloween costume, the cat is beloved by procrastinators, and for good reason — it's equal parts affordable, achievable and adorable. 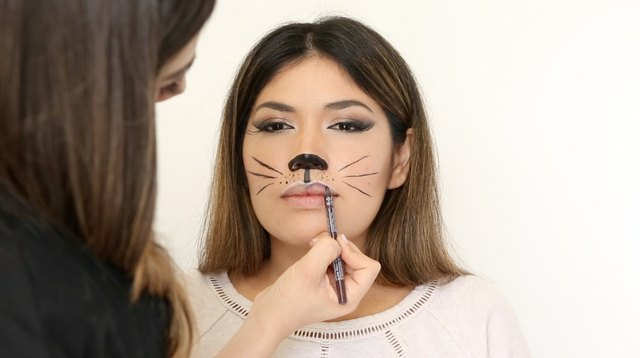 If you're feeling feline and looking for the best way to create this go-to costume, we've got a few tricks that'll get you party-ready in no time, that is, if you have a pair of pointed ears at your disposal. We'll even show you how to embellish the look with leopard spots, if you're looking to put a modern twist on the silhouette. 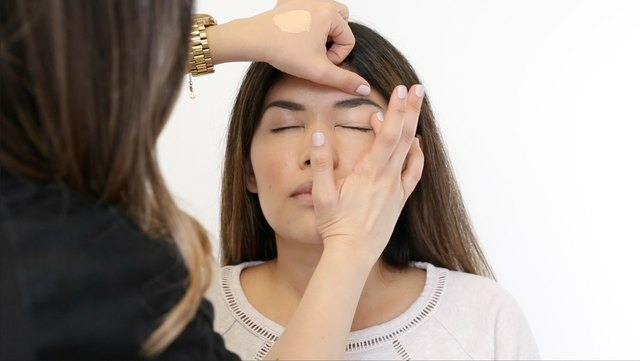 Before you begin, start with a primed base: apply foundation, fill in your brows, and highlight your cheekbones, the bridge of your nose and the middle of your forehead. 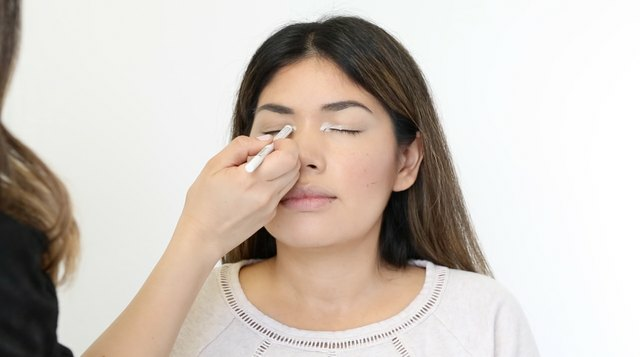 Apply eyeshadow primer to your eyelids for a long-lasting look. Highlight the inner corners of your eyes with white liners and extend the corners of the liner down toward your nose. Blend with your fingers and a brush. Apply a shimmery neutral eyeshadow (we used a salmon color) all over your lid. Apply with a flat brush for more intense color. Apply a darker shade of eyeshadow (we used a medium brown) in the crease, from the outer corner to about halfway across your lid. Blend the edges with a clean blending brush. 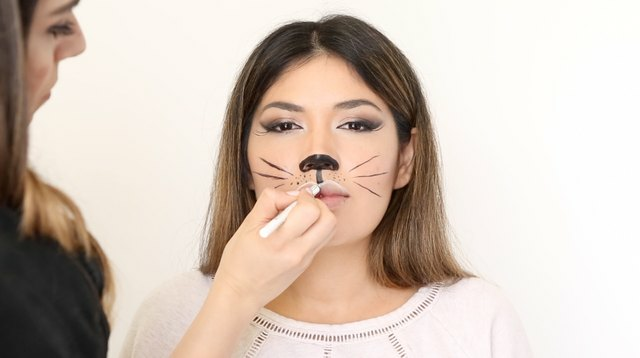 Apply dark brown shadow with a small flat brush to your eye line to outline the cat eye shape to smoke out the cat eye before adding black liner. 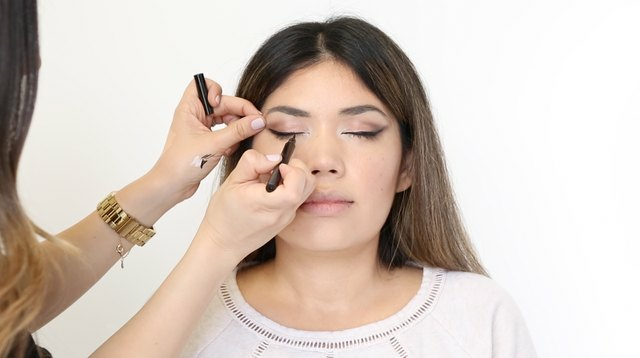 Line your upper lid, starting from the middle of the eye and creating a progressively thicker line as you work your way outward. Line the inner half of the upper lid with a fine line and connect with the rest of the line. Apply black shadow over the liner with an eyeliner brush and smoke it up with a clean blending brush. 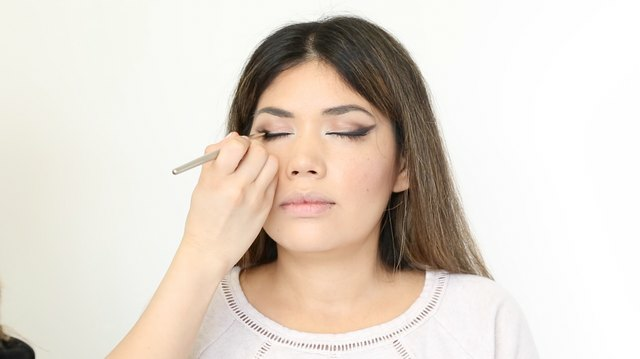 Once you're done smoking out the cat eye, use a clean blending brush to connect the dark brown crease color with the black liner shadow at the corner of your eye. 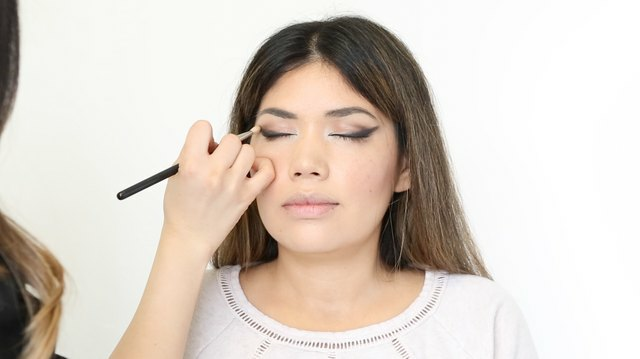 Apply the shimmery shadow to the middle of your eyelids to highlight. 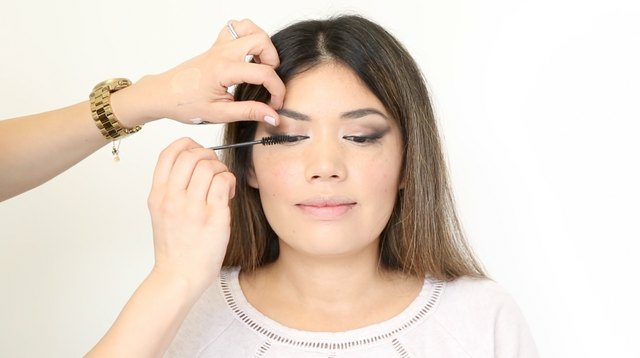 Curl lashes and apply mascara to upper lashes. 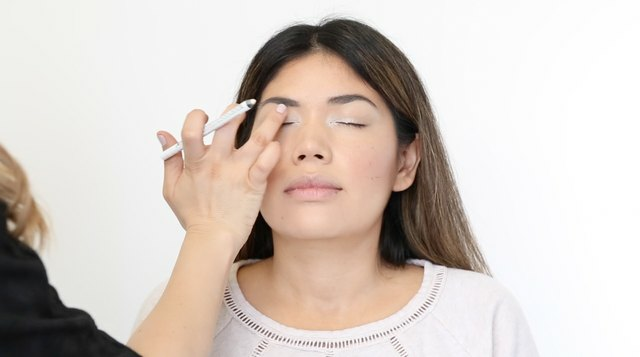 Apply white liner to the inner corners of your eyes and extend the line down toward your nose and blend with a brush. 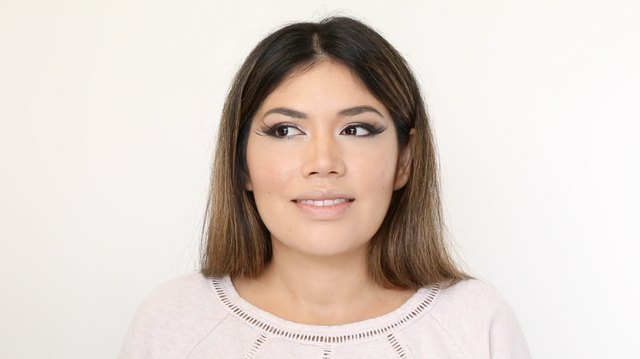 Apply false lashes, if desired. 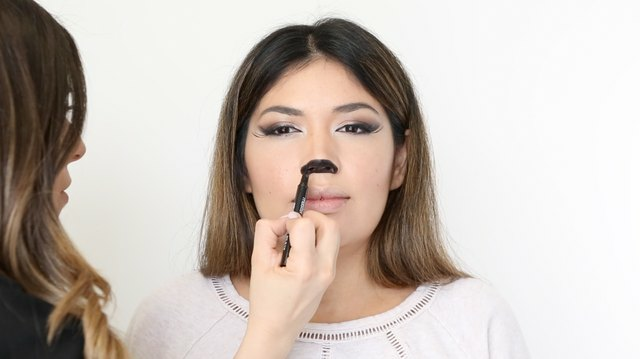 Use black liquid liner to color in the bottom half of your nose. Extend the liner down to your cupid's bow in the middle of your lips, and create small dots on either side of the line. 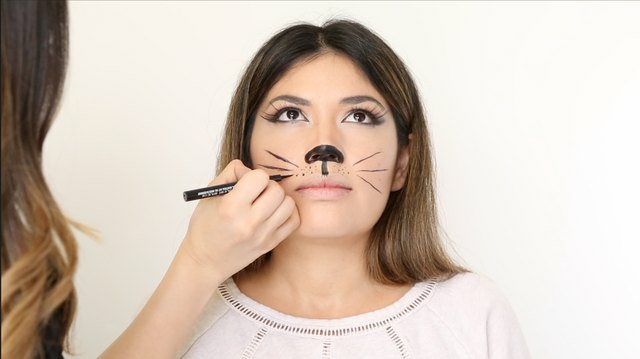 Draw on whiskers with the liquid liner as well. 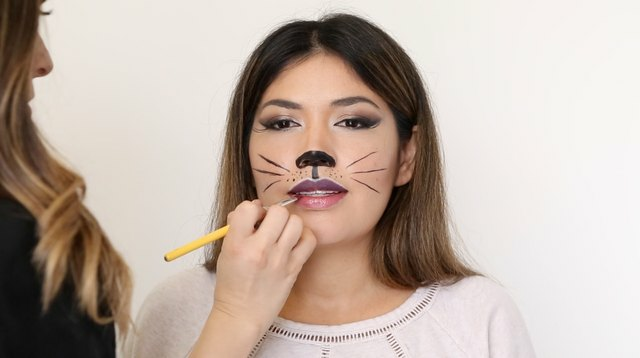 Outline your top lip with white liner to highlight. Lightly blend with your finger. Fill in your top lip with a matte lip pencil. We used a purple shade. Apply a lip gloss in a different shade to your bottom lip. We used a pink shade. 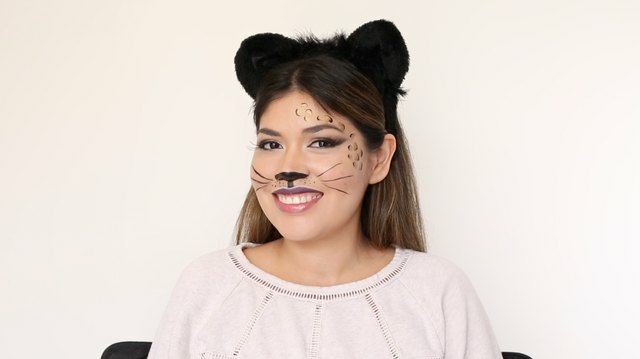 You can put on your cat ears and call it a day, or you can add a few leopard spots to the look. 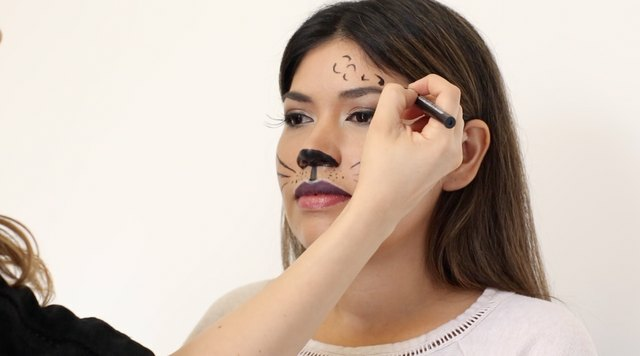 To create the leopard spots, take your black liquid liner and draw "C" shapes in various directions. 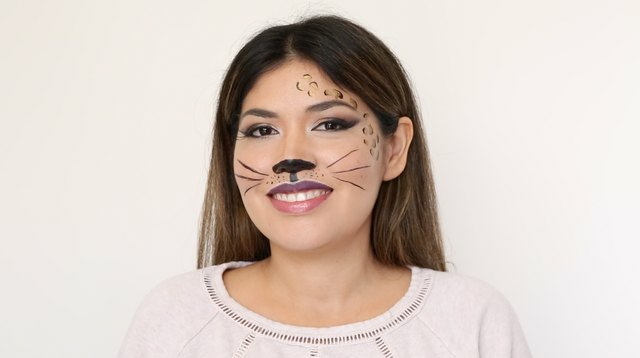 Fill in the "C" shapes with gold liquid eye liner. 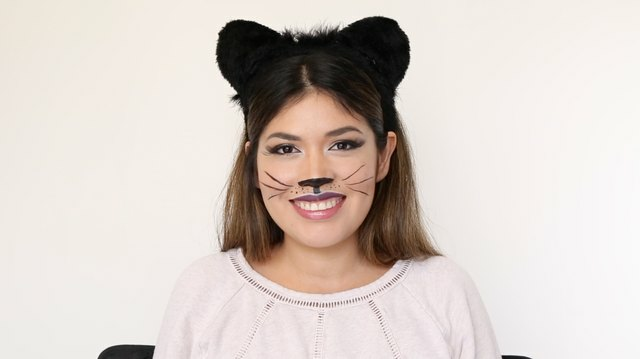 Complete the look with a pair of cat ears.